The Arab Spring revolution in Egypt fought against the thirty-year regime of President Hosni Mubarak through anti-government and pro-democracy protests. Inspired by the successful revolution in Tunisia weeks beforehand, the Egyptian protests began in January 2011. 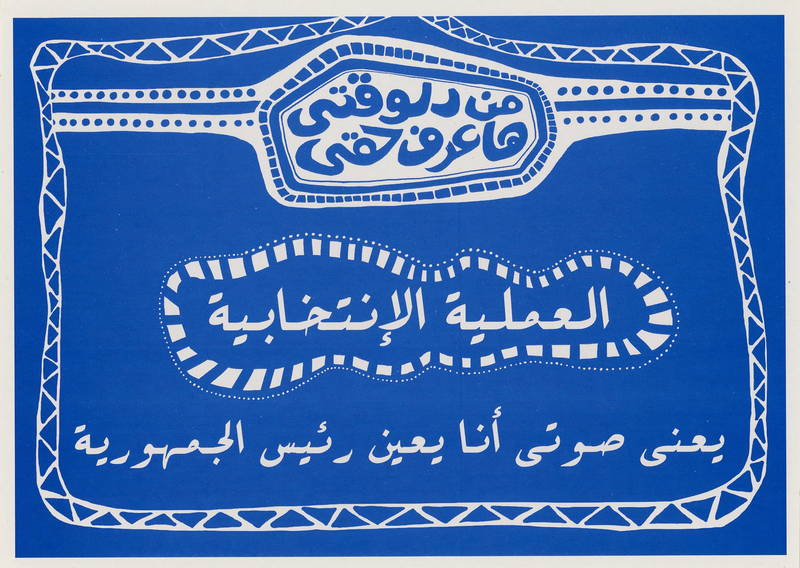 This sticker, written in Egyptian colloquial Arabic, is one in a series of four with colorful political messages. The empowering slogan at the top of each sticker من دلوقتي حاعرف حقي means: “Starting this moment, I know my right.” In the center, the phrase العملية الانتخابية translates to “the electoral process.” At the bottom, the text يعني صوتي أنا يعيّن رئيس الجمهورية means: “my voice (vote) will decide the president of the republic.” This sticker was catalogued in the spring of 2014 by Rebecca Clayman ‘17, a first-year student and gallery intern at St. Lawrence University. For the project, Rebecca interviewed Gisele El Khoury, director of SLU’s Language Resource Center and Arabic professor.